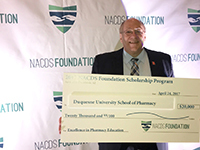 The Duquesne University School of Pharmacy won a $20,000 NACDS (National Association of Chain Drug Stores) Foundation Scholarship for Excellence in Education on Monday night at the NACDS Annual Meeting in Scottsdale, Arizona. Dean Bricker accepted the award, given to the School of Pharmacy for the upcoming program in the Hill District aimed at providing patients with complimentary Hepatitis C virus screenings and education through Duquesne University Pharmacy. NACDS selected the School of Pharmacy as one of eight winners from over 40 applications from schools of pharmacy across the country. Other winners included Nova Southeastern University, Ohio Northern University, Ohio State University, Union University, University of Colorado, University of Texas at Austin and the University of New Mexico.